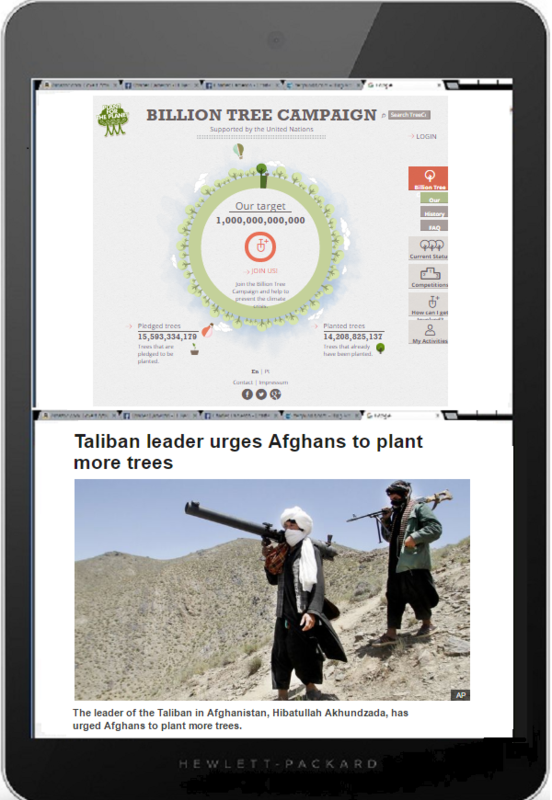 This admirable United Nations goal gains Taliban support..
Hidaya Foundation, Why Plant Trees? Victor’s post deserves to be read in full. I did not agree with Victor’s framing of the legal character of state sovereignty, to put it mildly, nor his normative assessment of R2P. Mr. Allen also described R2P somewhat differently than I have seen from other advocates, but I was less concerned by that as the concept does not seem to be presented with consistency by the community of R2P advocates and theorists. Having seen similar theoretical debates over the years about angels dancing on pins over 4GW, constructivism, EBO, Network-centric Warfare, OODA, Clausewitz’s remarkable trinity, nuclear deterrence, preemptive war, COIN, neoconservatism, free market economics, the agrarian origin of capitalism in England, Marxist theory etc. I am not too worried if Victor’s interpretation in its specifics is not ideologically perfect. It is representative enough. 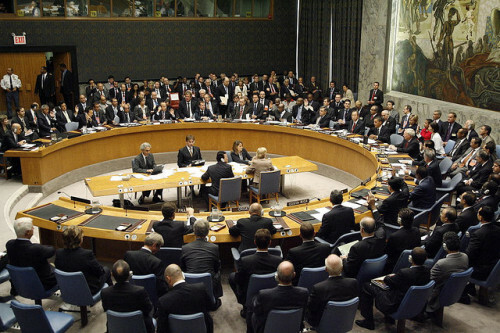 ….As far as premises go, the first point is highly debatable; the second is formally disputed by *many* states, including Russia and China, great powers which are permanent members of the UN Security Council; and the third bears no relation to whether a military intervention is a violation of sovereignty or not. I am not a self-contained entity either, that does not mean you get to forcibly enter my house. That R2P does not violate sovereignty stems from the evolution of sovereignty from its Westphalian form in the mid 17th century to the “sovereignty as responsibility” concept advanced by Deng, et al. Modern sovereignty can no longer be held to give states carte blanche in their internal affairs regardless of the level of suffering going on within their borders. Academic theorists do not have the authority to override sovereign powers (!) constituted as legitimized, recognized, states and write their theories into international law – as if an international covenant like the Geneva Convention had just been contracted. Even persuading red haired activist cronies of the American president and State Department bureaucrats to recite your arguments at White House press conferences does not make them “international law” either – it makes them “policy” – and that only of a particular administration. Again, I caution about reading posts in full. ….My main observation, however, is that the discussion thus far has been focused more on a “right” to protect than a “responsibility” to do so. The arguments indicate that a state has a responsibility to protect its people but takes for granted that third parties somehow inherit this responsibility when the state cannot fulfill it. There is a missing explanation here. The need to justify such efforts may seem callous, but a nation’s highest moral order is to serve its own citizens first. Such an explanation would certainly be a legitimate demand for a mother that loses a son who volunteered to defend his nation, or for a government entrusted by its people to use their resources to their own benefit. While it is often stated that the international community “should” intervene, explanation of where this imperative comes from is not addressed other than by vague references to modern states being interconnected. But this implies, as previously stated, a right based on the self-interest of states, firmly grounded in realistic security concerns, rather than any inherent humanitarian responsibility to intervene. 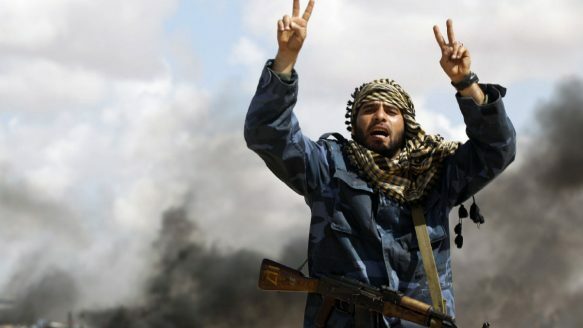 Instability and potential spillover may very well make it within a nation’s vital interests to intervene in another country and pursuing humanitarian and human rights goals within the borders of another state may well be in a nation’s secondary interests. But if this is the case, the calculus of the political leadership will determine if pursuing this goal is worth the cost/potential costs – as has been done in such cases as North Korea, Iran, Zimbabwe, Tibet and Syria. In either case, the decision is determined by what is in the nation’s interests, a reality that makes R2P not a mandate, but a merely a post hoc justification for interventions that do occur. Leonidas makes many good points, in my view, but the intellectual fungibility of R2P as a concept, its elastic and ever evolving capacity to serve as a pretext for any situation at hand is the most important, because it is potentially most destabilizing and threatening to other great powers with which the United States has to share the globe. In short, with great responsibilities come greater costs. In part II. I will lay out a more methodical case on the intellectual phantom that is R2P. I think it’s worth holding these two video clips in mind together, the young woman and the young man, she almost fatally wounded and now recovered, he happening to be at the right spot on the right moment to be interviewed, her words reaching us directly in her fluent English, his coming to us only via sub-titles, as in an art-house “foreign” movie… If she has eclipsed him, let us remember him again. The intelligence, the clarity. the education. And how many thousands more must there be, unviral and unsung, but no less intelligent? Unless ye become as little children, saith the Gospel, and a little child shall lead them, saith the Prophet.